The recipient of the Filmfare Award for Best Picture of 1982 marked the first time that Bollywood fans got to see two living legends together for the first time. Amitabh Bachchan was said to have wanted to work with Dilip Kumar for many years but kept waiting for the right script. The team of Salim-Javed were commissioned to write one with instructions to give both stars equal roles and were rewarded with the Filmfare Award for Best Screenplay for their efforts. 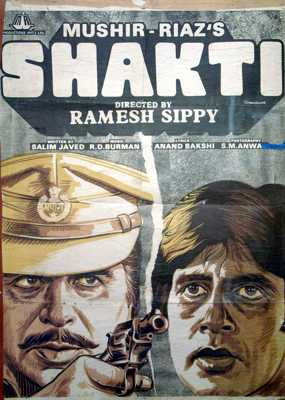 The story revolves around the relationship between the two stars (playing a policeman/father and his son) and the fateful decision made by Dilip Kumar's character early on in the movie. When confronted by gangsters who are holding his son ransom, the wafaadar cop refuses to negotiate with their demands, forever scarring his only child delicate psyche and thrusting him into a life of crime. This leads to an inevitable climax between the two much like what happened to a family separated by crime in 'Deewaar' (also written by Salim-Javed). Made by the same writing/directing team who brought us 'Sholay', this movie is a gritty and solid drama that is made even more complete with all the star power behind it. The star power doesn't just extend to the two stars which brings us to the character of Roma Devi, played by Smita Patil. A star of parallel cinema who was also an activist for the advancement of women and children in India, Smita Patil transitioned seamlessly into mainstream Bollywood and brought grace and dignity into any role she played. She died due to complications from childbirth at the age of 31 and her passing (like Madhubala before her) left behind an incredible void that was filled in time with the likes of Shabana Azmi, Nandita Das and Tabu. Her role as Amitabh's love interest could have been easily overlooked amongst the two leads but she remains one of the most memorable things about the movie. So who came out ahead in the old guard versus the new between Dilipsaab and Amitji? The Filmfare Award went to Dilip Kumar even though Amitabh was nominated in three out of the available five nominations (the other two movies he was nominated for were 'Bemisaal' and 'Namak Halal'). As a fan of both, it came out to a draw for me as they both have such different styles and showcased them brilliantly for this movie. 'Shakti' broke new ground not only for the pairing of the two aforementioned stars in their first and only movie. It also did so for having only three songs in the entire film during a time when big Bollywood movies mandated at least six to fill up the soundtrack. Today's selection is Humne Sanam Koby Lata, a beautiful number that is just enchanting in both it's music and delivery. R.D. Burman provided the music and usually reserved his best work for wife Asha Bhonsle but Lata just takes this song (about writing a letter to her lover) and makes it something special. Indeed, she insisted on singing it during a tribute concert to R.D. shortly after he passed away. Much like the movie 'Heat' in which Al Pacino & Robert Deniro shared the screen for only a few key scenes, 'Shakti' does the same with Amitabh & Dilip Kumar and the end result for both movies is the same - an instant classic that holds up years down the line. I always thought smita patel was so beautiful and graceful, much too good for the likes of Raj Babbar. Isn't that who she married? I have a lot of catching up to do with the works of Dilip Kumar. I've seen many of Amitabh's films from the 1970s and early 1980s, but somehow managed to miss Shakti (many have recommended it as a Dilip favorite) and Deewaar (would you believe it?). Could you please share any Smita Patil recommendations? I'm not sure if you've seen Jaane Tu Ya Jaane Na (2008), in which Patil's son Prateik Babbar made his debut (in a supporting role). He's been very well appreciated. His first film in a lead role (filming now) is called 'Dhobi Ghaat' and marks the directorial debut of Aamir's wife Kiran. Kiran - I agree about Smita and yes, she supposedly was the 'other woman' when she broke up and subsequently married Raj Babbar. TBF - I would stick to Dilipsaab's B/W films to get a true appreciation of him and would DEFINITELY see this and 'Deewaar' as 2 definitive Amitabh movies. Smita Patil's arthouse movies that I love include: Arth, Aakrosh, Nishaant, Chakra and Ardh Satya. Her most famous (and best) Bollywood movies were this one and Namak Halal. Thanks for the tips on her son's movies, will have to check them out! I was looking for articles on my favorite movie, (Shakti) and came across your blog. Pretty well written I must say. Just one correction, Shakti had 3 picturised songs: One with Dilip Kumar, the one you posted and the Kishore-Lata duet. Very Good review, its a movie thats always been on my list, and i shall get a copy soon. Neel - thanks for the heads up on the songs, I didn't remember the 3rd song until you mentioned it. BWD - thanks for stopping by and hope you get to see it soon. I've been looking for some good Smita Patil recos--thanks! Just saw Arth and was blown away by her, hands down! This is a movie about performance that makes this work. Nida - just read your review on 'Arth' and loved it. Now that you have seen Smita Patil I think you will appreciate this movie even more with 3 legends of Bollywood on the screen together. Nitesh - I agree, sometimes performances cancel eachother out but in this case they just make the other's better. Hi Sanket. I just wrote about Deewaar here, thought you'd find it interesting :) Hope all's well. Cheers.